A new chapter in the fight against dementia has begun with the launch of Reading Well Books on Prescription for dementia in Wales. Since its launch in England in 2013, Reading Well has reached 778,000 people, and 96% of those who borrowed a book from the dementia list said it had been helpful. The Welsh rollout of the scheme – Darllen Yn Well – is funded by the Welsh Government and delivered by The Reading Agency in partnership with the Society of Chief Librarians Cymru. The Reading Agency is also working with the Welsh Books Council to make the books available in Welsh for the first time and to create adapted Welsh-language resources to support the scheme. Reading Well Books on Prescription for dementia provides information and advice, support for living well, advice for relatives and carers, and personal stories. The list also includes fiction, memoir and photographic books used in reminiscence therapy. All of the titles are endorsed by health professionals and are free to borrow from all Welsh library authorities. An official launch event for the initiative was held at the European Association for Health Information and Libraries (EAHIL) conference in Cardiff on 11 July 2018, followed by a drinks reception in the palatial halls of the National Museum of Wales to keep everyone nicely distracted from the World Cup semi-final! We also heard from expert by experience Andrew Woodhead, who, as an individual currently living with younger onset dementia, emphasised the importance of a person-centred approach to dementia care, holding up Reading Well title Hearing the Person with Dementia as a prime example. The founder of the original Books on Prescription scheme Professor Neil Frude and Vice Chair of SCL Cymru Nicola Pitman highlighted the vital role libraries and reading play in boosting health and wellbeing. Browse #ReadingWellWales and #DarllenYnWellCymru on Twitter to catch up with more launch activities and pictures. The launch festivities continued on Thursday 12 July with a special tea party for residents of Fairwater Day Centre in Cardiff, complete with homemade Reading Well/Darllen Yn Well cupcakes and a RemPod, a reconstructed 60s living room designed to encourage reminiscence and improve quality of life for those in care. Cardiff libraries are good for your health! The new Dementia Action Plan for Wales highlights a clinical need for Welsh-language resources, as native Welsh speakers with dementia may only understand or be able to communicate in their first language as their condition progresses. 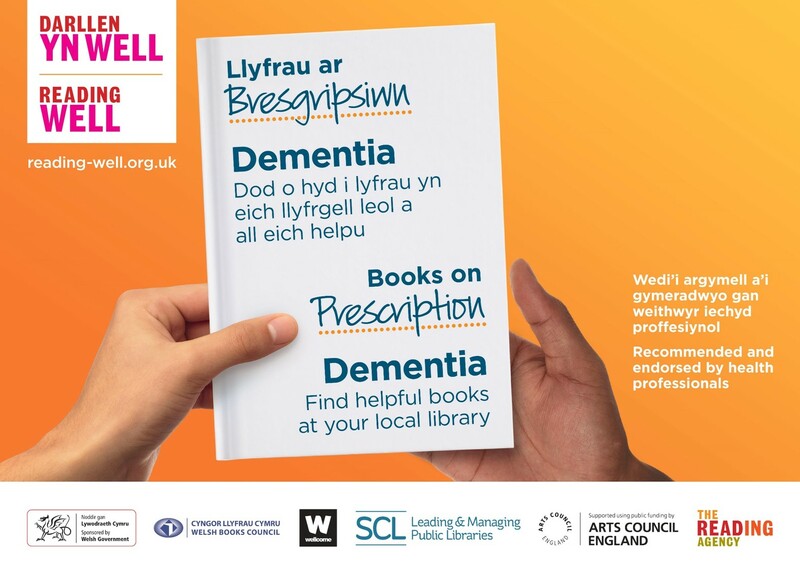 Reading Well Books on Prescription for dementia supports the Welsh Government’s Dementia Action Plan and has the endorsement of the Welsh Government. The scheme is supported by Alzheimer’s Society, British Association for Behavioural and Cognitive Psychotherapies, The British Psychological Society, Carers UK, Dementia UK, Innovations in Dementia, National Association of Primary Care, NHS England (IAPT), Royal College of General Practitioners, Royal College of Nursing, Royal College of Psychiatrists. Get in touch to share details about Reading Well in your area.